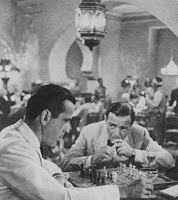 One of my favorite lines from the movie Casablanca is when Humphrey Bogart's character shoots a look at Peter Lorre, in that way only Bogart could, and informs him, "I don't mind a parasite, just a cut-rate one." Bogart crystallized his feeling for someone like Lorre's character in the same way I feel about media hacks. In general, I don't mind them as they are a reality in today's world, I just mind cut-rate ones. This brings me to Today Show's Matt Lauer who seems to personify the very splendor of cut-rate media hackery. There is no doubt who the Today Show's democraphic is: a strange, distorted 5th Avenue view of "soccer mom" sensibilities projected via the likes of Lauer, Meredith Vieira, Ann Curry and Al Roker. The very flower of that sensiblity, the vaccous and incredibly shallow Katie Couric, has now moved on to "anchor" [in more ways than one as she sinks the ratings] the CBS Evening News. It's that lack of pretense acting as a lackey for the White House that's so disturbing. Since Lauer went the whole nine yards with this frame why not just go that last yard, cut to the real intent of the question, and change the wording to reflect that: "Tim, by aiding, abetting and sympathizing with terrorists doesn't this undermine the Democrats posing as real patriotic Americans?" the concept of U.S. defeat? THE VICE PRESIDENT: I can't." And Limbaugh is the unapologetic winger here. If there is even the slightest difference between Lauer's and Limbaugh's framing, then I guess I've been taking too many of Morpheus' blue pills.